Do your research before you choose your cake designer. Some designers specialise in different types of cake, such as modern, traditional, floral, novelty etc. Find the style of cake that you want and then choose the cake designer, if you ask them to make something that is completely not what they do then you probably won’t get the best results. There are loads of ways to customise your cake and make it personal. Don’t be afraid to ask for customisations. One of the best and most simple customisations is matching the sugar flowers on the cake to your wedding flowers. Always bring as much info to your cake consultation as possible; pictures of your dress or swatches of fabric, invites, pictures of jewellery, shoes or the venue. You will be surprised at how many great ways there are of incorporating these elements into the cake design. The cake will most likely be the central focus, or at least one of the central focuses, of the room. Therefore it’s vital to make sure that the cake looks good in the room, and not totally out of place. Make sure, when choosing your cake, that you have considered the colour scheme of the venue and that particular room, and the general style. 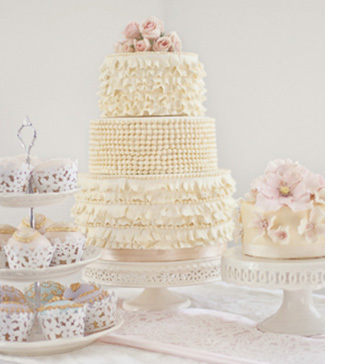 An extravagant Baroque style cake will probably look very out of place in a cosy country barn-yard venue. Choosing the right size is also very important. You may have very tall ceilings in the venue in which case a short cake will probably look underwhelming. You also need to consider how many portions the cake needs to serve and whether you will be serving the cake with coffee or as the main dessert. This will affect the portion size, as wedding cake portions are usually smaller than party cake portions. These days there is so much choice when it comes to cake flavours, so you needn’t just stick to one throughout all the tiers. You can have each tier a different flavour, incorporating ‘safe’ flavours and more unusual flavours, to make sure that you please everyone.